Here it is, my debut short fiction collection: Ferenji and other stories, published by Doire Press of Galway. Official publication date: 1st November, 2016. But don’t miss the launch a little ahead of that on Thursday evening, 27 October at the Irish Writers’ Centre. 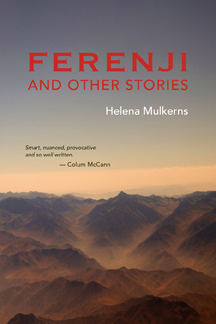 Ferenji is a themed collection of short stories set in Africa and Afghanistan, with six main characters mainly based in conflict or post-conflict zones. It’s the fruit of meeting John Walsh and Lisa Frank of Doire Press, whose literary publishing house has been building up a rich reputation for publishing excellent new work from writers and poets for almost a decade now. Doire’s first title was a debut poetry collection from Miceál Kearney titled Inheritance which won the North Beach Poetry Nights’ Grand Slam Prize. Their second was a short story collection by Susan Millar duMars, Lights in the Distance. With the metamorphosis of the world of publishing from the category of innovative Arts champion to often corporate multi-national, Doire returns to the essential, the classic prototype of a quality literary pubishing house. From years of being put off because all publishers wanted to know about was “my novel,” which I simply never wrote, Doire didn’t pester me for a novel. They accepted that I write and love to write short stories. Currently, more than ever, it is a format that is favoured as a result of post-modern distraction and endless busy-ness. People like short stories because they are stories with characters and meaning and they are short. My stories, in fairness, have been published fairly steadily down the years in anthologies, newspapers and magazines in the US, UK, Ireland, Australia and even Croatia. My first, published by Cíarán Carty, was shortlisted for an Irish Hennessy Award and my debut in an anthology (Ireland in Exile by Dermot Bolger, New Island) was praised at the time and followed by about two dozen more published in other anthologies, magazines and newspapers. Another was nominated for the American Pushcart Prize, and a Manhattan dancer even created a contemporary dance piece inspired by it. But the great novel eluded me. Mostly, when I’d get through six chapters, I’d suddenly see a fantastic short story in the middle and open a new document to write that instead of knuckling down and starting Chapter 7. But that’s the way, and I am so very happy to have met John Walsh and Lisa Frank, who also like short stories, and who liked mine enough to publish them. Please join me on 27 October for the launch of my book at the Irish Writers’ Centre, and if you can’t – check out DoirePress.com and pick one up there!